I love summer, but here in the South, it gets so hot that all I want for lunch or dinner is something light and refreshing. And I definitely don’t want to spend much time in the kitchen cooking near the hot cooktop or oven. This past Saturday, we had for dinner Honey Chipotle Chicken with this tomato cucumber avocado salad. 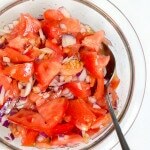 It was a light, cool and nutritious salad that is a great summer salad for cookouts, BBQ or any day of the week. 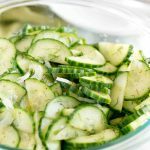 You can eat it as a side dish to some grilled chicken or steak. 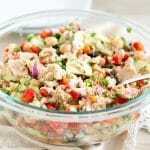 You can also serve it as a salad topped with some grilled chicken strips or salmon. Either way, it’s delicious and easy to make. Even my husband who doesn’t like avocados cleaned up his plate. 🙂 Tomatoes and avocados are some of my favorite vegetables to eat in the summer. And I also like to incorporate in my recipes a lot of fruits this time of the year. I just love a mix of sweet and savory. And what are your favorite summer vegetables or fruits? Add cherry tomatoes, cucumber, avocado, red onion and garlic in a medium salad bowl. Sprinkle minced parsley. Pour olive oil over salad, and season with salt and pepper. Note: Add avocado right before serving if you are planning to refrigerate the salad. One of my FAVORITE summer salads - Tomato cucumber avocado salad. So colorful, flavorful and easy too! Add avocado right before serving if you are planning to refrigerate the salad. I hear ya on not spending too much time in the kitchen during summer months. Especially in our NY apartment where it heats up fast! I loooove this salad though. My husband makes a similar one with avocado and celery; this is definitely a must-try for me. Pinning! 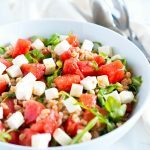 This is the perfect summertime salad!! I’ll be making it for my next BBQ. Great! I hope you like it!! 🙂 Thanks for stopping by, Renee! What a perfect summer salad. Tomatoes and avocados are my favorite fruits of summer, along with sweet corn. I could eat tomatoes every day in the summer! This looks so good!